Cleaning the oven is one of those dreaded household tasks that most people avoid. Or at least I hope that most people avoid it, and that I’m not the only shirker. Cleaning the oven tops my list of “I-would-rather-be-bitten-by-fleas-but-I’d-better-do-it-anyway” jobs. Baking can certainly lead to a dirty oven. Pizza night often means spilled mozzarella cheese in the bottom of the oven. Since we replaced our oven last year, I’m diligent about keeping it clean. Oven care is so very necessary. These appliances do not come cheap. Regular maintenance can mean the difference between a long oven life and a short one. Not only does regular cleaning mean longer oven life, there are also safety concerns associated with dirty ovens. These safety concerns include risk of fire, smoke inhalation, reduced efficiency, undercooked foods, and altered flavors in baked goods. Let’s address the first major concern- the risk of fire. Food and grease that have dripped and been burnt onto the inside of the oven and its window will continue to burn whenever it is used. The first clue that you have this buildup can be seen in any smoke that leaves the oven when you open the door. There shouldn’t be smoke coming from your oven. 😉 Not only is this buildup a fire hazard, those smoke particles can be detrimental to your health. Breathing in that smoke can be dangerous. The dirty buildup on the oven will increase cooking and baking times. 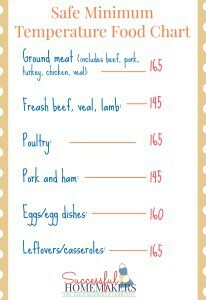 This will mean that your meals will take longer to cook, thus costing more in operating costs. Stick an oven thermometer inside and see how far off your oven is from your intended temperature. Keep that oven thermometer in your oven to keep tabs on the temperature. A dirty oven will also alter the flavors of the foods, particularly baked goods. This continuous burning of spills and grime creates nasty carbon-based fumes. These fumes will alter the taste of bread, cakes, and other baked goods. Now that we’ve established the importance of maintaining a clean oven, we’ll explore that 3 common methods of cleaning it. You know that this job needs to be done regularly, now how are you going to tackle it? Use natural products and a little elbow grease. I always go for option #3 because I prefer not to risk my life while cleaning my house. And choosing option #1 or #2 would definitely require risking your life. I mean, seriously, option #3 is the most logical choice, in my opinion. Why do I choose option #3? First of all, those chemical sprays are some of the most toxic household cleaners in existence. Check out this government warning regarding oven cleaners, and see if you don’t agree. The words “usually fatal if swallowed” are enough to send me running in the opposite direction while screaming my head off. So, commercial chemical sprays are a no-go. What about using the self-cleaning feature? Many people assume that the self-cleaning feature – since it presumably does not involve chemicals – is a safe choice. Not so fast. Self-cleaning ovens work by heating the oven up to 900 degrees Fahrenheit (Yes, I said 900 degrees! ), reducing the residue on the walls of the oven to ash that can be wiped or dusted away. The problem is that the walls of many self-cleaning ovens are coated with Teflon or a Teflon-like product that releases toxic fumes when it’s heated to such a high temperature, not to mention that the smoke from burning grease is enough to induce an asthma attack. I used the self-cleaning feature on an oven just one time, a long time ago, early in my homemaking days. The oven was INCREDIBLY hot. The smoke detector was going crazy. And the oven door was locked shut. When it finally completed this cycle, it took a long time for the lock to release. I was not able to use the oven for an entire day using this method. Furthermore, the instructions that come with self-cleaning ovens recommend that you open windows and doors and utilize fans and vents whenever you are operating the self-cleaning feature. That’s enough for me, but if you need more convincing, how about their suggestion that you re-locate birds and small pets while the oven is cleaning itself? Apparently, birds can die from the fumes given off by a self-cleaning oven. Some people even suggest that the self-cleaning feature is harmful to the oven itself (the above-referenced article mentions that repairs to the oven are often required after people run the self-cleaning cycle), which is not hard to believe, considering how hard we are asking the oven to work for several hours at a time. So what’s a girl to do? Thankfully, there are ways to safely and effectively clean your oven without endangering your life. In fact, you have several options. Now that we’ve covered what NOT do, click next to find out what TO do in order to clean an oven without endangering your life. I hope by now you are convinced that option #3 is the only way to do this important job. For really big jobs, you might consider a cleaning stone (also called a pumice stick or scouring stick). These are 100% natural scouring stones (shaped in a block or stick) that safely scour away even the worst build-up. They are safe for most ovens, although you may want to check your ovens’ owners manual to be sure. Just a little water and one of these blocks and you will see a sparkly new side to your oven that you forgot existed! Another popular option is to generously sprinkle baking soda (that amazing household wonder) all over the surfaces of the oven interior, then spray it with water or vinegar. Allow it to sit overnight, then wipe clean in the morning. You may have to scrub a little or repeat the process until the job is done. My sister actually combines water and baking soda in a spray bottle, sprays it all over her oven surfaces, and then proceeds to use her oven. She says the heat makes all the dirt flake off with the baking soda, so when her oven cools down after baking, she just wipes it down. If your mess is not a serious one, my favorite method is the citrus method. All you have to do is place some citrus peels (limes and lemons work particularly well) in a shallow pan and cover them with water. Place them in the oven at 350*F for about 20-25 minutes (Don’t leave them in any longer or your peels will burn. Don’t ask me how I know), then turn the oven off and allow it to cool. As soon as you can scrub it without burning yourself, wipe away the grease with a rag or sponge. Once your oven is clean, you will want to keep it that way! If your oven manufacturer recommends it, place a large piece of aluminum foil under the coils on the bottom to catch any drips, and replace it regularly. (I have a gas stove, and this is not recommended for my stove, so be sure to check!) The aforementioned citrus method is also great for oven maintenance – periodically do a citrus cleanse on your oven after you’ve baked (while the oven is still hot). Cleaning your oven doesn’t have to be dangerous, but it does need to be done regularly. 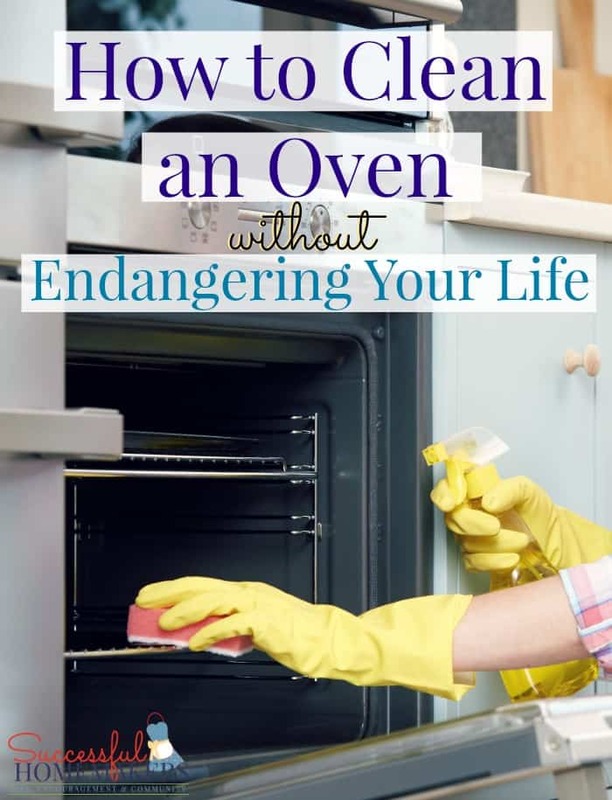 I hope that you’ve enjoyed this article on how to clean an oven without endangering your life! If you have any tips to share, I’d love for you to share them below! And be sure to share this post with your fellow homemakers so that they can learn these tips and stay safe! This is such an awesome post- thank you! I am looking for more natural ways of cleaning and the oven is one place I haven’t figured out yet, so I will definitely be trying this! My husband and I are moving soon, so I will have two ovens to clean (our apartment before we hand in the keys and the new oven). I’m trying to use up my chemical cleaners and switch fully to natural methods by the time we move in a few weeks. Thank you again! This post is perfect timing for me. I have been needing to clean my oven for way too long, but usually that requires all of us to leave the house for a few hours with the self cleaning option – it’s a little scary. I will have to try the baking soda method, with a little elbow grease(the oven is pretty bad). Thanks! Great post! We are moving in a few weeks so this is very timely for me, since I will have to do a very intensive cleaning on the oven before we go! I have not cleaned it much in the past because it was so difficult. I will definitely be trying your tips. Seriously great tips! This will come in handy when I go clean mine! The pumice stone works so wonderfully! After hours and hours (AND HOURS…LOL!) of scrubbing, we found out about these sticks at lowes! It took some elbow grease, but this worked wonders!!! I’m going to try the baking soda trick soon! Thanks!! Great article! I sell Norwex and we have oven & grill cleaner that is enzyme based. It’s a safe option. I’d love you to try it! Please revise your recommendation to use aluminum foil in the bottom of the oven. Not a good idea, depending on the age or type of oven. Some of the stories I’ve read have to do with affecting temperature and baking (because of the reflective side of the foil) or having the foil melt onto the oven floor. Apparently foil has a teflon coating that can heat up and melt, because some of the newer models have the heating elements just under the oven floor. In 2013, the installer of our new oven told me the same thing: don’t line the bottom of the oven with foil. Thank you for visiting and commenting, Diana! Thanks for sharing these simple and useful tips. My sister just bought a new oven and she’s decided to use only natural ways to clean it. I think your post is exactly what she needs right now, so I’m definitely showing it to her. Thank you for the good advises and ideas! Congratulations to your sister on her new oven! Thanks for visiting and passing along these tips to your sister! Happy Baking! Seriously, you may have just saved my entire family’s life tonight! I thought it might be an efficient thing to do tonight to turn on my self-cleaning oven just as I went to bed, but I decided to Google “safe to clean oven overnight” and came across this and one other article. I am embarrassed to say that I had NO IDEA that the self-cleaning cycle could be so dangerous!!! Carbon monoxide?! Oh my!! Nothing to be embarrassed about! Who would think that it would be harmful, especially if it’s an available option on your oven! I’m glad you found our article and it helped you!! !